8923 MT more guar gum has exported from April-2018 to Nov-2018 than previous year. As per the data released by the Agricultural and Processed Food Products Export Development Authority (APEDA) Indian has exported 330978 MT guar gum. 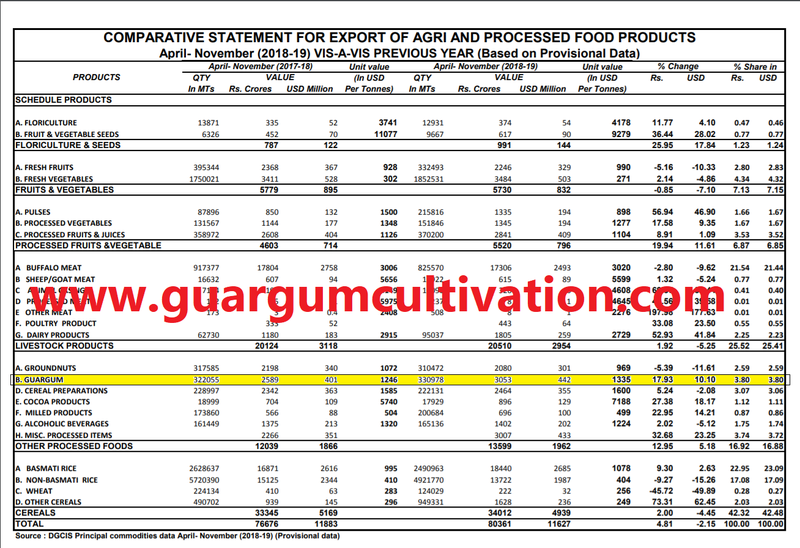 Values of guar gum export fromApril-2018 to November-2018 is INR 3052 Crore or USD 442 Million at the rate of USD1335 / MT. Previous year during the same period India exported 322055 MT guar gum. Value of exported guar gum powder was INR 2589 Crore or USD 401 Million at the rate of 1246 USD/MT. This is very positive news for Indian guar gum industry. 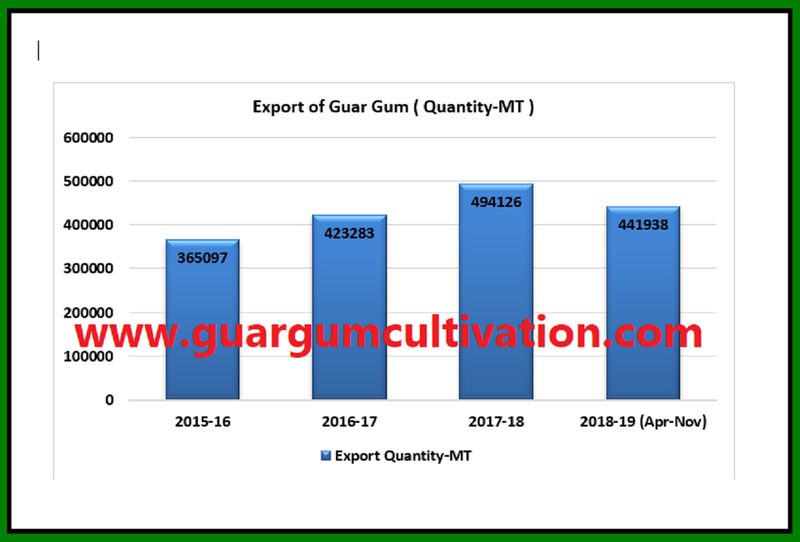 Export of Guar gum powder is increasing continuously since last four years. Export of Indian guar gum is increasing with increasing oil and gas drilling activities. Shale crude oil and natural gas production is increasing. Traditionally Saudi Arabia was the leader of crude oil production and Qatar was leader of Natural gas production. Now USA has become the new leader of crude oil and Natural Gas production. USA is using fracking / hydraulic fracturing activities for shale oil and gas production. Guar gum powder is used as drilling chemical in this process. USA, Norway, China, Netherland, Russia, UK, Germany, Italy. Argentina are major destination for export of Indian Guar gum. In monetary term India has exported guar gum of 17.93 % more value in Indian rupees and 10.10% more value in USD in comparison to previous year for the same period. As per existing trends it is estimated that this year quantity of Guar gum export will cross the figure 6,00,000 MT. This will be very positive trend for Indian Guar gum industry and Indian guar gum seed farmers. This year Guar seed production is lower than previous years. As per Baker Hughes Rig Count ,1083 Rigs are active in USA which are 154 more than previous years rig count at the same time. Rig count is as indication of demand of drilling services and chemicals. Guar seed and Guar gum commodities are being traded strong on physical markets due to strong export demand of guar gum. 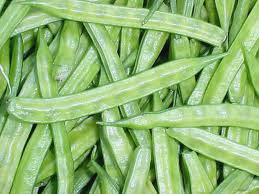 Prices of Guar seed and Guar gum both are quoted higher then previous close. Forward price of Guar seed and Guar gum are also strong due to buying at lower levels in local markets. Bold quality of guar seed is traded at Rs 4300/100Kg and average quality guar seed is traded at Rs 4200/100 Kg. Standard quality guar gum is traded at Rs 8400/100 kg. In interior location, guar seed is traded up to 4100/100 Kg. Guar seed is being traded strong in the future market. At NCDEX (National Commodity & Derivatives Exchange Ltd) guar seed-10MT is closed at Rs 4350, 4393, 4439 higher by 2.38 percent or INR 101/100 Kg, 2.48 percent or INR 106.5/100 Kg, 2.53 percent or INR 109.5/100 Kg with open interest of 81930, 66230, 1880 for January, February and March month contracts. Guar gum is being also traded strong in the future market. At NCDEX (National Commodity & Derivatives Exchange Ltd) Guar gum- 5MT closed at Rs 8572, 8669, 8572 higher by 2.99 percent or Rs 249/100Kg, 2.95 percent or Rs 248/100Kg, 0.6 percent or Rs 51/100 Kg with an open interest of 28430, 47375, 330 for January February and March month contracts. 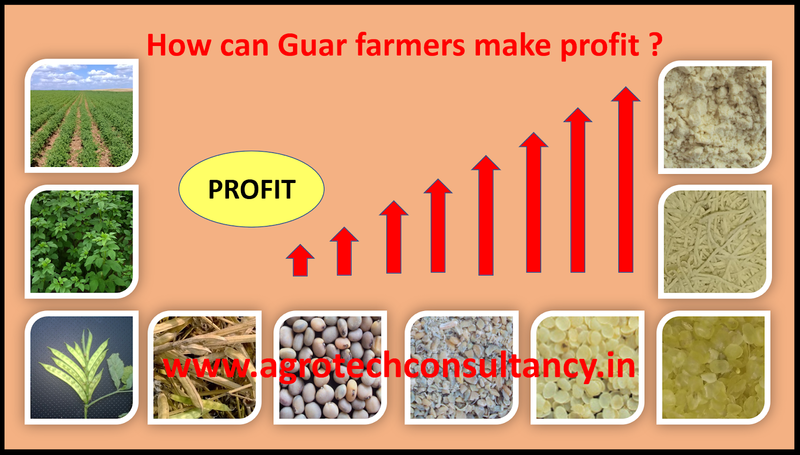 Guar seed farmers can make extra profit from their corp with collective decisions and better marketing strategies. Go for warehouse receipt funding. Farmers require money after harvest. Instead of selling to Traders at the time of lower prices, farmers should store his commodity in bank approves collateral managed warehouses. Bank will finance to farmers up 80%-90% value of commodity. Interest rates are very low for farmers. they can complete their financial need from that financed money. Commodity will be under control of farmers. Once the prices of Guar increase in market. Farmers can repay the funding to bank and get his commodity out from warehouse and he can sell the commodity in open market. He can directly sell that commodity to commodity exchange while commodity remains laying in warehouse. Instead of selling commodity in small lots. Farmers should make a group and make a big lot for selling. It will reduce the operational and transportation cost. It is easy to store the big lot in ware house. It easy to weight it in one lot. Some notorious traders and processors make manipulation in weighing. Farmers should take the weight of their produce at known weighing bridge before selling. Put the commodity on the plastic sheet for auction. Generally, farmers put the guar commodity on auction platform without any plastic sheet. If commodity in not auctioned on time, then it keeps scattering. If will be put of plastic sheet, then farmer can cover his commodity in case of non-auction. Sometimes open laying commodity leads to unnecessary moisture loss. Farmers can cover his commodity if commodity remains laying, they can save the wastage and moisture loss. Farmer can directly sell to processors/factories. There are some schemes where processor don’t need to pay the MANDI tax if farmers are selling directly to them. Processor don’t entertain the small quantity. There are many points where farmers need to be careful like percentage of wastage declared by the processors, actual weight of commodity, deduction of weight of packing bags. Value addition of guar seed. Though there is nothing to value addition with farmers except agriculture production of guar seed. If farmers make some strategy group level then they can get the guar seed processed any closed processing factory at Job work. They can store the guar gum with NCDEX. If future prices of guar gum are good, then they can hedge the guar gum prices. They can sell the Guar Churi/ korma in open market to farmers / Cattle feed manufacturer. Always there is some margin at every point of value addition. Farmers should try to go for value addition as much as they can if they find some additional margin. Instead of individual approach farmers should go for collective approach and strategy. With collective approach farmers can make minimize the operation cost of commodity selling process. Always avoid distress selling. If prices fall below the expectation, then there is always possibilities that prices will bounce back in near future. 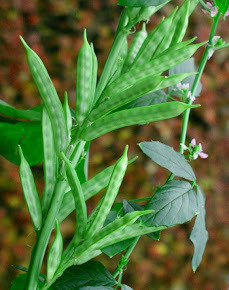 Guar is a arid crop it is grown only in one climatic belt of world. More than 90% are of that belt comes on Indian and rest 10 % Area is in Pakistan. Guar is an industrial crop. It is processed into guar gum powder. Guar gum powder is used many industries due to its unique chemical and physical quality. 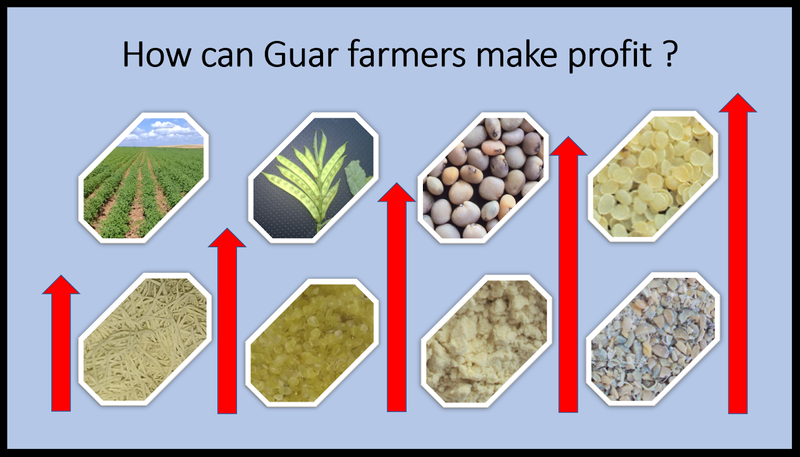 Guar Farmer should take Guar as secondary crop. Guar farmers should not take it as a primary crop. Once it become the secondary crop then cost of cultivation will come down and opportunity cost of land increases. Profit from low cost cultivation crop will be always high. It will control the supply of crop in market. Priority crop for selling by farmers is always primary crop. Farmer will not go for urgent selling of guar crop. Commodity will be stored with farmer and there will be leverage with farmers if prices goes up. Farmer should not sell his complete production of Guar in market just after harvest. It will control the flow of produce I market. In first lot farmers should sell only 30% commodity. In the case of price rise after peak arrival. Farmers will have some quantity to encash the increased prices. Always go for cleaning and Grading. At the time of peak arrival sell the low category material. When there is peak arrival all the material is considered as low quality. Farmers will get good price of lower quality. At the time of increased prices good quality material gives good rates over the increased prices. Generally, traders will try to negotiate at quality at increased prices to get the produce from farmers at cheaper price. Major portion of guar gum powder goes to oil and natural gas well drilling activities. If Farmers get an overview that crude oil prices are keep increasing continuously then he should hold the Guar as much as he can. It will give good return after the peak arrival. 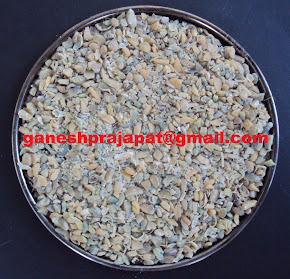 Guar Churi is by product of guar gum processing industry, which is produced up to 70% of quantity of guar seed. It is rich in protein content. Farmers purchase churi korma for their cattle regularly as cattle feed. If the prices of guar Churi Korma is increasing in market, then it is indication that prices of animal feed protein are increasing, and it is indication that Guar seed prices are stable at lower side. Guar Churi Korma is substitute of Soya Meal which is used as animal feed protein. NCDEX is forward market. In case of future demand prices of forwards contracts remains higher than current month. Farmers will have an idea about future demand and price movement. If Future prices are poor, then there is prediction of poor demand and downside movement in coming future. Farmers can make alternative strategy in case of poor demand. Hedging the future high prices. Hedging is good strategy to manage the risk of future price fall. NCDEX provides free training to farmers for commodity trading. Farmers should make tradable (10MT / 100 Quintal in NCDEX) lot of their commodities and hedge the prices. In the case of future downfall in prices. Farmers will safe and they can sell the Guar as per hedged price. Generally hedging is opted to avoid the risk price fall. Dependency on oil and natural gas industry is taking the guar seed and guar gum prices in uncertainty. Though crude oil is a commodity and it is fuel for global economy, but it has emerged as geopolitics weapon. Global power are trying to prove them selves as superior to control the crude oil prices. With one decision and meeting prices of crude oil start to move ward and next day with another decision prices of crude oil starts to fall. Up and down in prices is regular trend in any business. When demand goes down or production increases then prices tends to go down. Indian Guar seed and guar gum industry is taking the downward crude prices as negative factor. In reality prices of crude oil is going down as production of crude oil is increasing in USA. Today USA is producing more than 11.7 Million barrels per day. USA economy has become net exporter of crude oil. All this development has happened because of shale crude oil production, which uses fracking technology. Guar gum is major drilling chemical/ingredient in fracking technology. 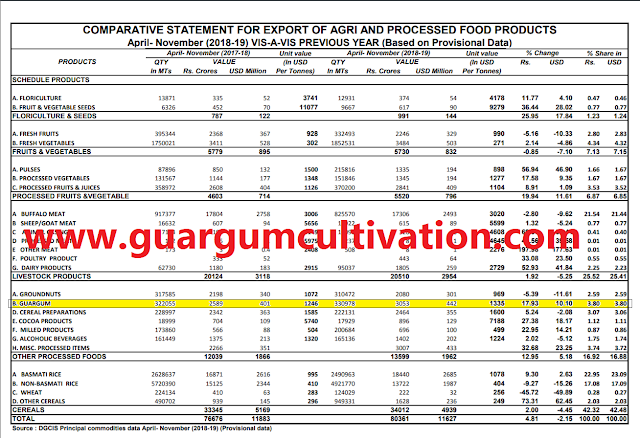 If we look at the data of guar gum export. Then we find that guar gum export is increasing. South American countries have emerged as new destination for Indian Guar gum. Indian Guar gum industry and traders should not respond immediately after guar gum price change. As per global rig counts data there are 144 more active rigs count then previous year in this week (08/12/18) USA. Arrival of Guar seed in market has dipped due to election, winter and marriage season. This time is last time of peak arrival after December arrival of guar gum will be fall below 10000 -15000 bags per day. Small farmers have already sold their stock after the harvesting as they don’t have holding capacity. Physical demand of gaur is still very high.